Relic Entertainment's Warhammer 40,000: Dawn of War II appears to no longer be available for purchase at GameStop. Why? A person claiming to have knowledge of the matter says it's because of the game's association with Steam. As of January 15th, according to Google's cache, GameStop was still taking pre-orders for the real-time strategy game. But as of yesterday, nothing. 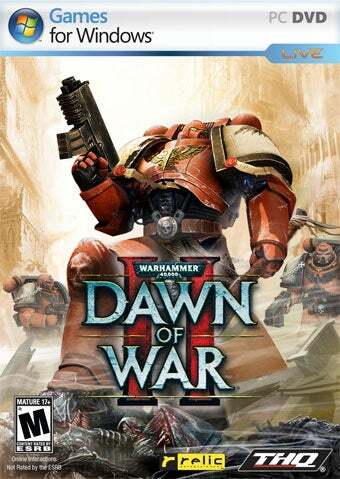 The product has disappeared from GameStop.com and calls to brick and mortar GameStop stores indicate that Dawn of War II is no longer available for pre-order. That's a bit curious, considering GameStop was, at one point, offering an exclusive "Chapter Command Wargear Set" to those who pre-ordered the game and the title is still a month away from release. Normally, we'd expect a product to be delisted from GameStop's product database if it were canceled. But the game just went "gold," with publisher THQ moving the Warhammer 40,000: Dawn of War II's release date a few days earlier. And it's available just about everywhere else games are pre-sold. So, what about that allegedly contentious Steam relationship? According to what we were told, it's the (supposedly) required install of Valve's digital distribution platform that has rubbed GameStop corporate the wrong way. That would be an odd stance to take on Dawn of War II, considering the same is true for games published by Valve. But maybe not so odd, considering GameStop's apparent stance on games released on digital distribution platforms prior to being released at retail. Penny Arcade's Mike Krahulik told Wired last April that the retailer objected to carrying a boxed version of Penny Arcade Adventures: On The Rain-Slick Precipice of Darkness, which was launched on the Greenhouse platform. Perhaps not coincidentally, the Steam-exclusive beta program for Dawn of War II kicked off this week. We've contacted multiple representatives at THQ, GameStop and Valve to attempt to get confirmation on the reasons behind Warhammer 40,000: Dawn of War II being pulled from GameStop's web site. Unfortunately, we've yet to receive response to our questions from any party, despite multiple e-mails and phone calls. Consider this rumor for now. But if you have a pre-order in with GameStop, EBgames or Planet X for Dawn of War II, you might want to give them a call and see what's up.